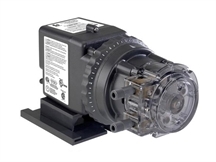 Stenner Feeder Model 45M2 - 0.5 GPD to 10.0 GPD, 25PSI Max Stenner™ Classic Series metering pumps are self-priming and the 3-point roller assembly provides a positive 2-point seal on the pump tube at all times. This eliminates the need for anti-siphoning valves and diaphragms. The patented mechanical feed rate control (adjustable models) allows the pump's output to be scaled from 5% to 100% with the simple turn of the dial. All 45/85 M Series Feeders have discharge pressures from 0 to 25 PSI. Included with every pump: - Mounting bracket - Spare tube assembly - Injection check valve - 20' LDPE polyethylene-NSF/FDA approved suction/discharge tubing (white or black): - 1 ceramic (clay) weight - 4 connecting nuts - 4 Ferrules - Instruction booklet. Dimensions are 10" x 6" x 5-1/2"